“The one thing proponents of helmet legislation seem to ignore is that the fact that helmets do nothing to improve road safety, say the CTC. Helmet fanatics assume a helmet law can only improve safety. They ignore the likely consequences: a decrease in cycling and an increased risk of accident. They seem unaware that helmets are useless in major accidents. Never underestimate the tactics used by helmet fanatics. They appear sincere and well-meaning. Their emotive arguments appeal to the uninformed, particularly non-cyclists. Their smokescreen fizzle out once more informed opinions are brought to the limelight. People realise that the negative consequences outweigh the potential benefits. Bicycle helmet laws are motivated by a desire to improve safety. Yet when they have been implemented, the main result has been to reduce cycling. This imposes healths costs by reducing the health benefits of cycling. Are the benefits worth the costs? An Australian study concluded a helmet law may provide a small benefit under extreme assumptions. It ignores the increased risk of accidents from risk compensation, a well-known safety factor. It assumes a helmet law only reduces cycling by 4%. This is inconsistent with evidence from countries with a helmet law, where cycling dropped by half. It assumes polystyrene helmets prevents fatalities. This is despite acknowledging in the discussion section that this is not true. It assumes a 100% compliance rate. It assumes helmets reduce 50% of head injuries. The most recent research summary concludes helmets reduce 15% of head injuries, while increasing neck injuries. It ignores that helmets increase neck injuries. Many of these assumptions are at odds with the available evidence. With such a track record, a bicycle helmet law has little to offer. Even optimistic assumptions cannot make it viable. “In August 1999, Philip Dunham, then 15, was riding his mountain bike in the Great Smoky Mountains National Park in North Carolina and went over a jump on a trail. As he did, his back tire kicked up, the bike flipped over and he landed on his head. The helmet he was wearing did not protect his neck; he was paralyzed from the neck down. The increase in the volume of the head, coupled with the gripping of the road surface, means that when a head comes into contact with the ground at speed, the head or body is rotated, sometimes snapping the spinal cord. This is a dangerous aspect of cycling with a helmet. You run the risk of paraplegia or quadriplegia. In 2010, a helmeted cyclist died in Wanniassa (Australian Capital Territory). The pathologist’s report to the coroner shows that that he suffered diffuse axonal injury. Diffuse axonal injury is a severe type of brain injury aggravated by bicycle helmets. These are not unique incidents. Many studies have reported increased neck injuries from bicycle helmets. For example, research by McDermott et al. (Trauma, 1993, p834-841) found 75% more neck injuries among helmet wearers. Why don’t bicycle helmets have warnings about the risk of permanent disability while wearing them? This is a serious risk that people should be aware of. One-fifth of cyclists who have been treated over the past four years were not wearing a helmet. In Western Australia, more than 30% of cyclists are not wearing helmets. If only 20% of injured cyclists are not wearing helmets, then cyclists without helmets are less at risk of injury that cyclists with helmets. How are more helmets going to make cycling safer? Many Australians have been led to believe that mandatory helmets makes cycling safer. In Western Australia, There were 1,244 cyclists hospital admissions in 2011/2012 compared to 640 in 1985/1986, before the helmet law. This is despite 30% fewer cyclists who cycled daily. Since the helmet law, the rate of cycling hospitalisation has tripled. A similar outcome was found in New South Wales, Australia. Why call for more of the same failed policy? Mandatory helmets have become the standard solution for cycling safety in Australia. Even though the policy hasn’t worked, many people can think of little else. Decades of helmet propaganda have made people switch to automatic responses. When will we start asking better questions? 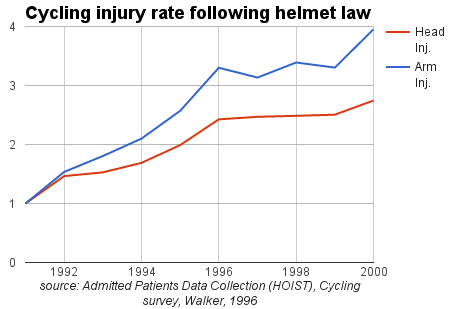 Why has the injury rate tripled since the helmet law? 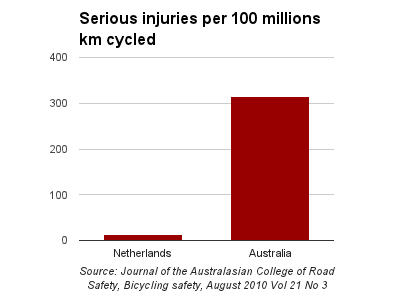 Why are cycling serious injuries in Australia 22 TIMES higher than in the the Netherlands? Why have cycling accidents increased since the helmet law? perhaps we need to look deeper about what is really going on. Wearing a helmet can make us feel safer. However feeling safe is different than being safe. After a helmet law was introduced in Australia, many cyclists insisted their helmets had saved them. How can both be true at the same time? They can be true at the same time if there is a large increase in accidents. From the injury data, this is what happened. This is the paradox of bicycle helmets. People believe their helmets saved them, despite suffering more injuries. The irony is that the helmet saved them from accidents that may not have happened without the helmet. It seems “obvious” & “intuitive” that wearing a helmet should reduce injuries. Yet sometimes our intuition can be wrong. Sometimes there are consequences we cannot see that are more harmful than what seems obvious. This surprising result not unique to Australia. Other countries have experienced increased injuries following an increase in helmet wearing. In New Zealand, a study found that injuries more than doubled following a bicycle helmet law. A 1989 US study found that helmet wearers were 7 times more likely to have accidents. How can a flimsy piece of polystyrene compensate for 7 times more accidents? It is a strange ideology, where helmets and accidents justify each other. Cyclists wear helmets because they have frequent accidents. Wearing a helmet increases the risk of accidents. Contrast this with countries that do not mandate helmets, like the Netherlands. Cyclists have little fear of accidents. Accident protection: many accidents protected by helmets. Australia. Can bicycle helmets compensate for more accidents? Choosing to wear a helmet seems a like “No brainer“. Such an obvious “precaution”. Choosing not to wear a helmet is a more subtle decision. It requires paying attention to what cannot easily been seen, rather than what seems “obvious”. 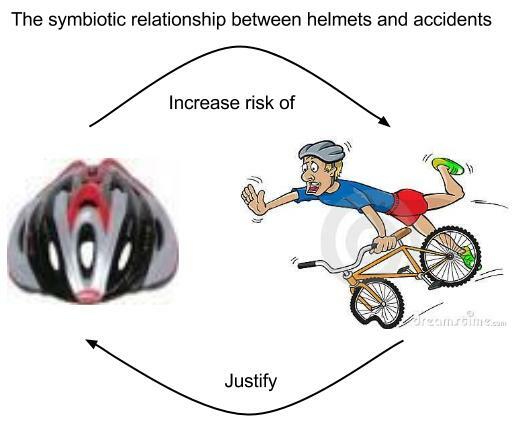 It requires an understanding of how helmets affect the risk of accidents. It requires comparing a higher risk of accident with protection from polystyrene. It feels safer to wear a helmet. Yet the evidence indicates it may not be safer. The paradox is: feeling safe is not the same as being safe. A parliamentary inquiry into cycling issues in Queensland, Australia, recommends reforms to wind back the controversial helmet law that has harmed cycling for 20 years. develop an evaluation strategy for the trial which includes baseline measurements and data collection (for example through the CityCycle Scheme) so that an assessment can be made which measures the effect and proves any benefits. exemption from Queensland road rule 256 for all cyclists age 16 years and over using a bicycle from a public or commercial bicycle hire scheme. Recommendation 16 might save Brisbane’s bike share scheme from being an embarrassing failure. Few people are using it, leading to calls for it to be wound back to stop the financial drain. Allow cyclists to treat red lights as stop signs. These are small and cautious steps towards winding back the disastrous experiment of the helmet law. It is a sign that legislators are finally willing to admit that it is time to reverse a policy that has reduced cycling while making it more dangerous.